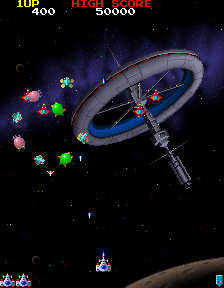 Journey to the faraway land of Galaga, a favourite place of game players everywhere. 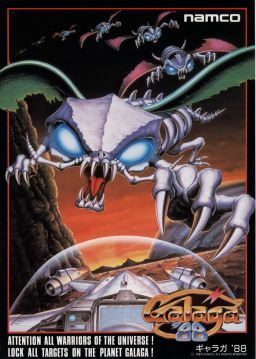 Players fight the mighty Galaga Army Corps to rid the universe of pesky space creatures. Battle through levels of new challenges and adventures for never ending entertainment. Skillful players can increase shot strength from single to triple firepower and increase shot speed. A super soundtrack awaits players who are expert enough to reach the many challenge stages. A new feature allows players to magically warp to mysterious new worlds and makes every game a unique experience. Relive a legend and contact your Atari distributor today! !